New data suggests that consumers plan to use their smartphones to shop during small windows of free time this holiday season, rather than during the traditional one-day rush. Most everyone has heard the sweet croonings of popular doo-wop group The Drifters. In fact their 1960s hit “This Magic Moment” could be marketers' theme song this holiday season. Data from Google and Ipsos MediaCT's "Consumer Holiday Intentions Study 2015" shows that 54% of consumers plan to shop with their smartphones during their spare time throughout the season, small junctures that marketers hope to turn into magic moments. Matt Lawson, director of performance ads marketing for Google, refers to these bits of time as "micro-moments." "People are busy," Lawson says. "They're traveling; they're commuting; they're watching their kids' soccer games. They're also tethered to their mobile phones, and therefore, as they start to shop for the holidays, they do so whenever they have a free moment." This optimal use of free time mirrors consumers' behavior during the last holiday shopping season. 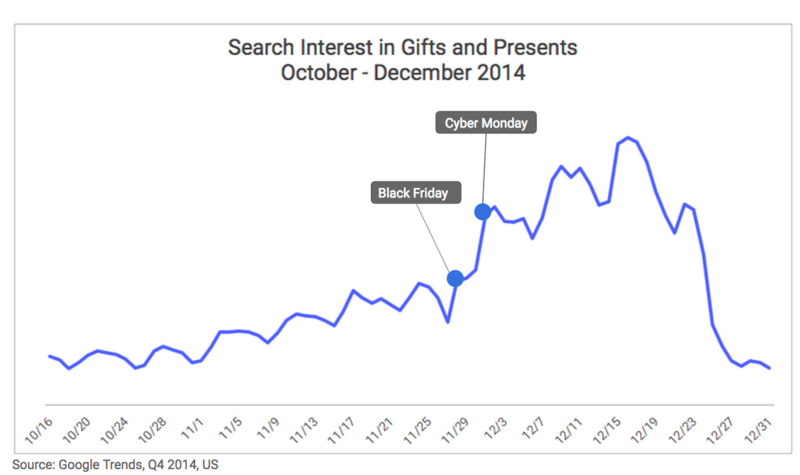 As Google Trends' data shows, searches for gifts were fairly consistent from October to December with fewer spikes on the historical key shopping days. With more consumers shopping during these brief interims, marketers have even less time to grab shoppers' attention. In fact, consumers are spending 7% less time in each mobile session compared to last year, according to Google Analytics' year-over-year September data. In an effort to capture shoppers' attention, Lawson says that marketers should follow one simple guideline: Be present. "We've seen engagement with shopping ads increase by three times when products show up in the top ads on mobile," he says. "Increasing budgets and bids to ensure that your top products are easily discoverable on mobile will reach consumers doing a quick search during their shopping micro-moments. And if those consumers have lost their way or abandoned their shopping cart, use remarketing lists in search ads to tailor your shopping bids and reconnect with them." Capturing consumers' attention during these micro-moments can have big dividends, too. The data from Google Analytics also shows that the amount of online shopping done with smartphones has surged 64%, and the information revealed that 30% of online purchases occur on mobile phones. Of course, consumers aren't just using their smartphones at the point of purchase. On the contrary, they rely on their devices throughout the shopper journey. Take the research phase, for instance. According to Google's global search data from November 2014 to October 2015, mobile shopping-related searches have increased more than 120%—catching up to those on desktop. 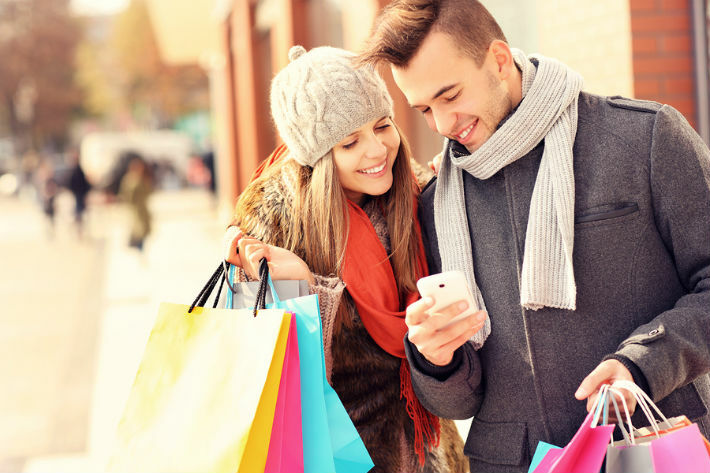 And according to Google and Ipsos MediaCT's data, 52% of consumers intend to use their smartphone before visiting a store this holiday season. Consumers are also using smartphones to break the chasm between the physical and online worlds. The aforementioned data set shows that 82% of mobile shoppers will review information on their phones while in-store. In addition, Google's year-over-year September data indicates that people are conducting 37% more mobile searches in department stores. "Recognize that just because people are shopping on their phone [that] doesn't mean [that] they will purchase there," Lawson says. "They may want to call in an order or walk into a store. Make sure that you have formats such as local inventory ads, click-to-call, and location extensions enabled and are able to measure all of the different ways that consumers convert." So, when should marketers start engaging in these magic moments? According to Google, the correct answer is now. Sixty-one percent of shoppers will have begun researching holiday purchases before Thanksgiving weekend, according to Google and Ipsos MediaCT—that's a 17% increase compared to last year; still, most will wait until later in the season to purchase. "The time to start influencing these decisions is now," Lawson reiterates. "In order to do this, take a look at your historical data and try to understand how much and when conversion rates and sales rose last year for your brand. Then, build a budget and promotion plan to anticipate that shift." Also, not surprisingly, Sundays seem to be the best day to reach mobile consumers. Based on its Q3 2015 data, Google found that mobile shopping searches are, on average, 18% higher on this day versus the rest of the week. Finally, Lawson recommends thinking about all platforms, including the Google-owned, video-sharing site YouTube. After all, more than one quarter (26%) of shoppers consider online videos their "go-to source" for gift ideas, according to Google and Ipsos MediaCT's data, and about one third (32%) say they intend to use online video more this year for holiday gifts.